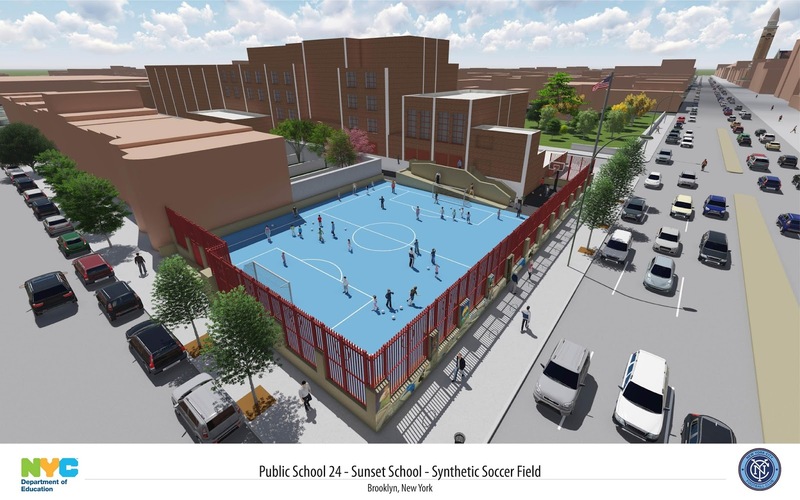 City continues its commitment to our community, with the announcement that they will be building a new synthetic soccer pitch at PS 24, just down the slope from me in Sunset Park. NEW YORK | The United Arab Emirates Embassy announced plans to construct a new, state-of-the-art soccer field at PS24 in Brooklyn’s Sunset Park neighborhood in collaboration with New York City FC. The new field will be completed and dedicated in September, as the 2015-16 school year begins. The soccer field is part of the UAE’s ongoing commitment to help restore communities in New York and New Jersey that were impacted by Hurricane Sandy. During the immediate aftermath of the storm, the UAE pledged $10 million for recovery efforts ($5 million in each state), to provide assistance to public schools and reconstruction work, and to fund the construction of all-weather playing fields. New York City Football Club and their foundation, City in the Community, will provide ongoing, complimentary after-school soccer programming and coaching for children at the school once the field is complete. The UAE Embassy and City Football Group, the majority owner of New York City FC, have collaborated before to provide deserving children access to quality playing fields along with world-class coaching and education programs. In 2012, the Embassy and CFG’s Manchester City FC unveiled a rooftop soccer field at PS72 Lexington Academy in East Harlem, the first of its kind in New York City. Today, the program at PS72 is organized and managed by City in the Community and serves more than 400 kids a week through after-school programs, promoting healthy eating and physical exercise. New York City FC players Khiry Shelton, Sebastian Velasquez, Kwadwo Poku and Patrick Mullins participated in the event and delivered the news to the children and other community members. They were joined at PS24 by UAE Deputy Permanent Representative to the United Nations Jamal Al Musharakh. “Today is such a special day for this great group of kids," Shelton said. "On behalf of my teammates at NYCFC, we can’t wait to come back in the fall to dedicate the new field and play soccer." “In the short time since we have been in New York, we have seen our fans’ passion for the game," New York City FC President Tom Glick said. "We are excited to partner with the UAE Embassy to continue the tradition of sharing the love of soccer with young fans across New York." During the surprise visit at the school, the kids received autographs and pictures with the New York City FC players, and were shown a rendering of their new soccer field. The players also led a soccer clinic for the kids. The PS24 soccer facility will be the ninth field built in the United States with support from the UAE Embassy. In partnership with local community organizations around the country, the UAE Embassy has also funded fields in Harlem, Washington, D.C., Dallas, Los Angeles, Chicago, Miami, Atlantic City, N.J. and Asbury Park, N.J.
New York City FC is the first Major League Soccer Club located within the five boroughs. 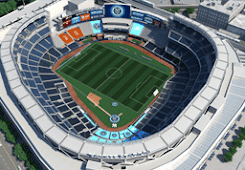 Majority owned by City Football Group, which includes Manchester City FC, Melbourne City FC and Yokohama F. Marinos, New York City FC play their home games at Yankee Stadium, which also home to minority owner, the New York Yankees. New York City FC kicked off their inaugural MLS season in March 2015. The UAE is a source of stability, tolerance, innovation, and growth in the Arabian Gulf and around the world. The United States and the UAE are close friends and strong allies, working together to promote regional security, create economic prosperity, and address pressing global challenges. In fact, the UAE is the largest export market for US goods in the Middle East and more US naval vessels visit UAE ports than any other port outside the United States. Cultural, educational, and medical partnerships between the UAE and US are spurring innovation, inspiring creativity, and increasing understanding in both countries. Really love to see this.